In his presentation, Stephen explored case studies of thriving digital brands, and examined the strategies behind their success, with a focus on how they used market intelligence data to make better decisions. Specific topics will include best practices for more effectively «dancing with the giants» (category dominators such as Google, Facebook, Amazon and Expedia), how to uncover your competitors' strategies, how to connect with Millennials more effectively, and what the new wave of digital success stories tell us about technology and consumers more generally. In 2017, 50% internet penetration reached majority of the population, and the number is still growing, and 50% of internet traffic is now mobile. In the U.S., time spent with digital has increased to 5.6 hours daily. So we are just entering the digitally-infused lifestyle. But we are also at the very start of how businesses are using this kind of information. Almost 62% of executives still use experience and advice more than data to make decisions. So how are some of the brands making better data driven decisions, and who is winning the internet? Fifty seven percent of top 100 traffic goes to the Big 5 — Google, Facebook, YouTube, Yahoo and Amazon. And after running an analysis, Stephen and his team found out that the number one player is ahead of the second one by 156% as of September 2017. So the category giants are pulling away. What does it mean for the 99% of the remaining brands that are not category giants? They need to learn how to dance with those giants effectively, says Stephen. One of the examples Stephen mentioned was the SEO strategy of Ralph Lauren brand. It gets all traffic from their brand name, and as searches become more generic, Amazon gains its share. Some companies are so fixated on their data, that they forget to take a look at what their competitors are doing. Not only do you need to know the amount of traffic your competitors get, but also understand where does conversion happen. If you’re just looking at traffic within a specific timeframe, that you may conclude that Hotels.com is doing much better. 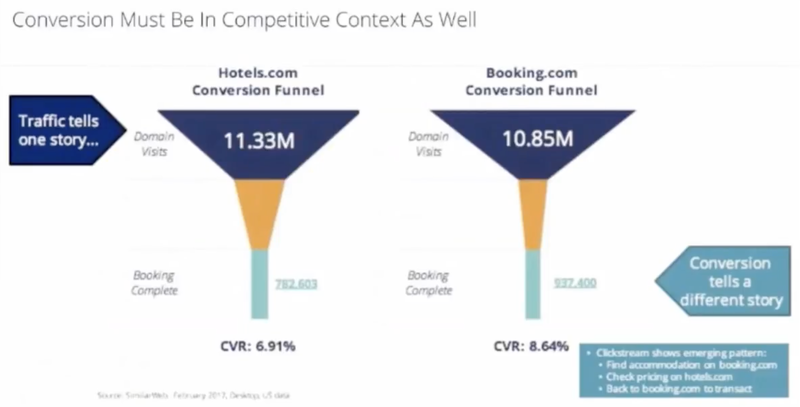 But Booking.com has a much higher conversion rate and is getting more bookings at the end of the day. But «stop flying blind' means more than just competitive benchmarking. For example, a lot of people are shifting to an onsite search like Amazon when looking for products or services instead of doing it through search engines. So being able to look into the hidden corners of the internet helps brands to stay aware of their environments and «stop flying blind». Stephen also talked about how some of the brands thriving by connecting more with millennials. As we think about millennials, they are now moving into a new marketplace and that is presenting opportunity. Automotive is one of the categories that presents an example of taking such an advantage by appealing to millennials using the right type of language. Chewy.com, for instance, has gone into a new category of pet supplies, even though previously they didn’t have much online activity. Now the brand is capitalizing on connecting with millennials. Successful companies do have certain characteristics. First thing that they do is make sure data is spread around the entire organization evenly. Based on a study ran by McKinsey, market intelligence success requires senior management buy-in. The number one factor for companies to perform well is ensuring senior management’s involvement in data and analytics. The second factor is designing effective data architecture and infrastructure, and making sure data is accessible across organization itself. This is what really separates the successful brands from poorly performing ones. Stephen Kraus is Chief of Insights for SimilarWeb, a market intelligence firm that helps the world’s leading brands understand, track and grow their digital market share. Steve is recognized as one of the world’s leading authorities on consumer insights and digital trends. 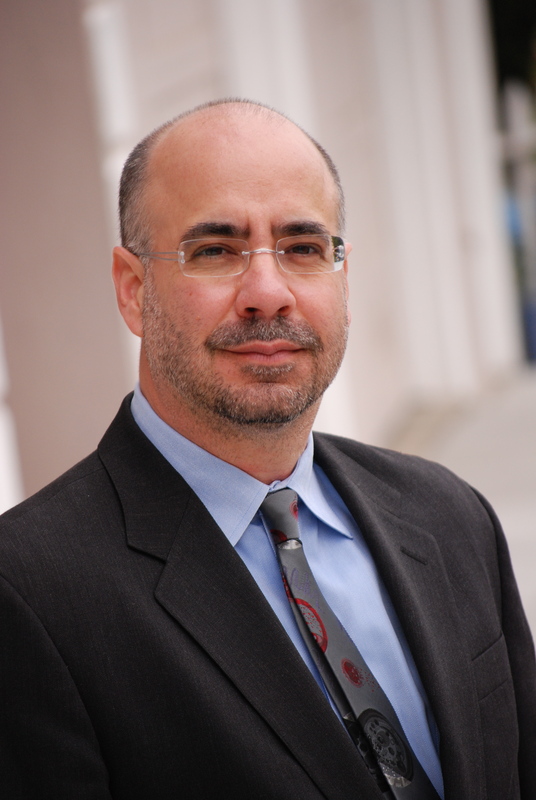 Author of three books and dozens of articles, Steve holds a Ph.D. in social psychology from Harvard University.